Are you looking for the best water purifier under 10000? You are at the right place. We have compiled a list of top 10 best water purifiers under 10000 available in India 2019. We have included best RO UV UF water purifiers from top brands like Kent, Eureka Forbes, Pureit, and Livpure. All these water purifiers perform well and provide clean and safe drinking water. All these water purifiers are priced between Rs. 8000 to Rs. 10000. If you can spend a bit more, check out the best water purifiers under 15k in India. We have listed various types of water purifiers on this list. The UV only water purifiers are recommended where the TDS is not high. If TDS of water in your area is high then go for the best RO water purifiers. Some of the purifiers have both RO and UV which is probably the best you can get in this range. Most of the RO+UV+UF water purifiers have 6-8 stages of filtration and provide great performance. Let's take a look at best water purifiers under 10000. Livpure is one of the best brands in water purifiers category. Here we take a look at the Liv Pep Pro Plus/Glo water purifier which provides a 7 stage filtration process water purifier at a price of around/under 10000. The sediment filter is the first stage of purification in this water purifier. It removes fine and coarse particulate from the water. The pre-carbon filter absorbs chlorine and organic impurities such as harmful pesticides from water. Plus, it also absorbs bad taste, color, and odor-causing organic compounds from water. The Antiscalant Cartridge is the third stage and prevents scaling of this water purifier’s membrane layers which results in improved purification. The life of the membrane is also increased. The R0 membrane is the fourth stage of purification, water is passed through the RO membrane at high pressure. This membrane removes hazardous chemicals such as pesticides, herbicides, heavy metals, hardness, and salts present in water. It also removes bacteria, viruses, and protozoa so your family is protected from microbiological threats from drinking unclean water. The ultraviolet disinfection is the fifth stage of purification in this water purifier. In this UV Stage, ultraviolet radiation makes water microbiologically safe to drink by disinfecting it from water-borne disease-causing bacteria, viruses, and protozoa. The sixth stage is ultrafiltration cartridge. The ultrafiltration cartridge effectively removes bacteria, giardia, cysts, and other harmful pollutants from water. It also removes fine suspended impurities from water, to improve its clarity. This is the seventh and last stage of purification where silver impregnated post carbon filter enhances the taste and quality of water by removing volatile organic impurities. This 7 stage filtration process is very effective and can convert water of TDS up to 1500 into clean drinking water. It can output 12L of drinking water per hour. So this was all about filtration process now let's talk about other features. 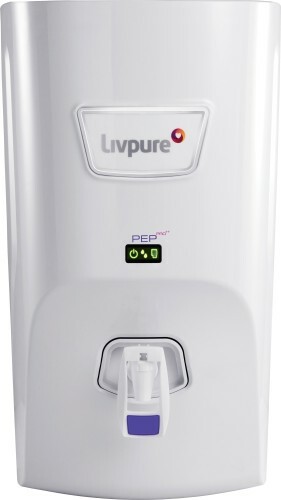 This Livpure water purifier has a very strong build and comes with an automatic switch on/off process. It automatically switches off when water tank is full and starts when the level is low. There are indicators on the front to display whether the tank is full or not. AO Smith X4 RO water purifier comes with 6 stages of purification namely Pre Filter, Sediment Filter, Pre Carbon Filter, Patented Side Stream Ro Membrane, Silver Activated Post Carbon. The functioning and role of these layers can be known here. This purifier uses RO technology for purification, hence is suitable for sources of water such as borewell, overhead tanks, municipal supply and can operate well for water with TDS less than 2000. At the output, it can reduce the TDS to safe drinking level because of RO purification. The total capacity of the tank is 9L which should be very much sufficient. The front of the purifier has smart indicators for Tank full or if there is a requirement of replacement of cartridges. It also comes with Auto start/stop and overflow protection feature and has a high output rate of approx 15 Litres per hour. HUL PureIt Classic RO + UV Water Purifier is a small portable purifier idle for small families and offices with a few employees. 1. Pre-Sediment Filter that removes fine and coarse dirt and impurities. 2. Pre-RO Carbon filter that removed bad taste and odor. 3. Post-Carbon Sediment filter used to remove dirt to improve the life of the RO membrane. 4. RO Membrane that removes dissolved salt and reduces the hardness(TDS) of water to level safe for drinking. 5. UV Chamber is used to make the bacteria and other harmful microorganisms inactive. 6. Post-RO Carbon Filter is the last stage and is responsible for enhancing the taste of water. With these 6-stages of purification, it strictly complies with the US EPA norms and can clean water with TDS up to 1800. It has 5L of storage tank making it a super portable purifier and can fit even in small places. It has alert system whenever the change of cartridge is required. It also comes with Auto Start/Stop and overflow protection features. HUL PureIt Classic RO + UV Water Purifier comes with purifier life of 4000L but that would vary as per the quality of the water in your area. You can get one year of manufacturer warranty and free installation on this HUL PureIt Purifier when you buy from here. HUL branded Pureit CLASSIC MINERAL RO + UV Water Purifier, is one of the most compact purifier design with 6L of storage. This purifier works on RO + UV purification principle and has 6 layers of purification. Pureit CLASSIC MINERAL can provide safe drinking water when TDS level of input water stream in less than 2000. It also has a level indicator for the bottom 3 litres of water and an advance alert system to alert you the regarding the need for replacement of germ kill kit 15 days in advance. It is a great value for money product as it is capable of removing 1 crore virus in 1 litre of water and also has a mineralizer technology that adds important minerals post purification from the 6 stages. Livpure Glitz+ Water Purifier combines the RO + UF technology to offer clean drinking water. It is highly compact and well designed. As with most other purifiers, this Livpure purifier also has 6 stages of purification namely Antiscalant cartridge, sediment filter, Pre-activated carbon adsorber, reverse osmosis membrane, UF cartridge and Silver Impregnated Post carbon cartridge. This stages combined removes turbidity, chlorine, hazardous organics and inorganics compounds. With its RO Technology, it can treat water with TDS up to 2000 ppm and can output around 12L of water in an hour. In this compact size, it weighs only 6Kg and has 7 litres of storage tank, which is simply brilliant. This purifier does not have any indicators for Tank full or alert/alarm system for change in cartridges but has Auto Start and Stop feature. Eureka Forbes from Aquaguard is one of the best brands for water purifiers from many decades. It comes with 7 stages of purification with consist of RO + UV + MP + MDTS to ensure complete and 100 percent cleaning of water. You get an option to adjust the TDS level as per the taste you need. Also, it can clean water with TDS up to 2000 levels making it suitable for all the areas and water from all the sources. So in terms of cleaning quality, this purifier does a good job. This Aquaguard purifier has a capacity of 6 liters which makes it suitable for a family of 3 members. This purifier comes with a premium look and design which will surely compliment your kitchen and you can either wall mount it or place it on shelve as per your convenience. It also has a unique membrane protector which acts as a protection for the membrane and enhances life and ensures proper cleaning. The cartridge has a life of cleaning 6000 liters of water which can increase based on the type of water you get in your area. So the cartridge can last for around 1.5 years based on average usage. This purifier has a smart indicator to display an error and a level indicator of the water. It is one of the bestselling water purifiers under 10000 in India and is our favorite as well. Bluestar Aristo comes with 6 stages of purification to clean the water using RO and UV purification process. The purification process ensures the output water is free from any bacteria, virus, microbes or any other dissolved impurities. It has a total storage capacity of 7 Litres making it suitable for family with 3 to 4 members. Apart from the normal filters, Bluestar has provided with an Aqua taste booster to enhance the taste of water which is great features. There are different indicators to display tank full, error or failure of UV and a purification ongoing indicator. The build material is ABS Food safe which is the same as seen in most of the purifiers. This purifier is available in black and white color and does a decent job. There is a child lock on the output tap to ensure your children does not play with it and the water is not wasted. The water has good taste and the purification is done well. Overall, for under 10000, this Bluestar purifier with 7 Litres of storage offers good features and quality. You get 1 year of warranty with this product. Midea is a new brand or a sub-brand of Carrier company and is a new player in the water purifier industry. This purifier has a big 8 Litres of a storage tank and offers 9 stages of purification to output crystal clean water. It relies on RO + UV + UF purification process to output clean water. The build quality is solid however the looks are not that impressive. Coming to the features, it can pure water with TDS up to 2000 levels making it suitable to clean water from most of the sources. The tank is built of N9 Antibacterial Plastic Tank and is among very few purifiers to feature the N9 antibacterial tank. On the front, you get alert for tank full, service alert and UV failure. The product has a warranty of 1 Year on Product and 1 Year on RO Membrane. The water purifier has all basic features, performs well and offers good value for money. Go for it if you have a budget of around Rs. 10000. This is a beautifully designed water purifier from Havells and comes in an attractive Silver and Blue color combination which would look elegant in your kitchen. On the features side, this UV Plus model has a 7 L of a storage tank with 5 stages of purification with UV + UF technology. The water purifier doesn't have an RO purification stage so it is not suitable for you if you get high TDS water in your area. With 7 Litres of storage, it is suitable for a family of 3 members. Since it does not have an RO filtration, you cannot connect it to the tank water where the TDS is a bit high. This purifier has three indicators for Self-diagnostic, purification, and tank full. The cover can be easily improved to clean it periodically. It comes at the pricing of around 8500 which is on a little higher side but if you are looking for a stylish purifier with UV and UF purification, then it is a good option. MarQ is a Flipkart brand and offers electronic appliances with good quality at very competitive pricing. This is one of the few RO water purifiers under 10000 which offers a big 10 Litre storage tank. This MarQ purifier has 7 stages of purification that gets rid of hardness, bacteria, virus and other harmful microbes in the water. It has RO + UV + UF purifier stages. This purification retains mineral in the water which is useful for the human body. The 10 Litre tank makes it suitable for a family with 5 to 6 members. The purifier has an attractive design with MarQ logo in the center. The 3 indicator LEDs are used to indicate power on, purification ongoing and tank full status. The water purifier has Tank Overflow Protection which uses an automatic float level Micro-switch. It controls the water level automatically and shuts off the pump when the storage tank is full. Overall, for a price of under 10000, this is a good purifier with great value for money and features. So this was our article on best water purifiers under 10000. We hope you were able to find a suitable water purifier for your home. It's time to take a look at our favorite water purifier on this list. If you want to spend around Rs. 7000, take a look at our list of best water purifiers under 6000 and 8000 in India.